Indie developer Arcen Games sent Co-Optimus an e-mail tip announcing the availability of their latest strategy game, AI War: Fleet Command. The demo can be grabbed off their official website, CNet and other sites. The full game or demo is also available via Stardock's Impulse service for $20. From the images I've seen scattered around the 'net, it seems like an extremely robust game, definitely one for the Real-Time Strategy genre fans. See the full announcement below. 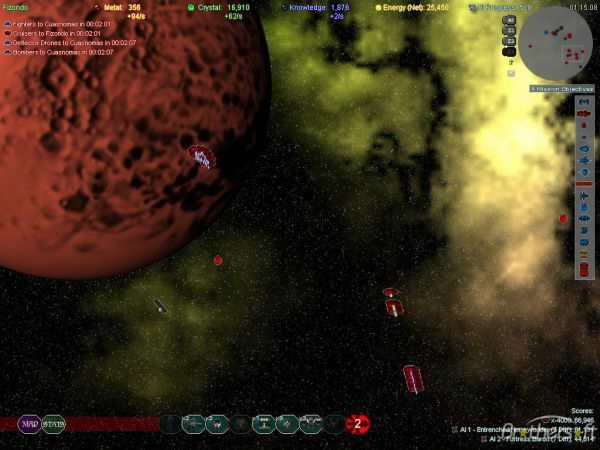 - Cooperative RTS game (1-8 players) with numerous unique ship types. - Challenging AI (some of the best in the genre) in 26 styles, many with unique superweapons. - Insanely high unit counts: 30,000+ ships in most games. - Lengthy campaigns featuring 80+ simultaneous planetary battlefields. - Different Every Time: 16 billion procedural maps, each with specific units. - A focus on deep strategy that you don't get in most RTS games. This is a game created by genre veterans for genre veterans, but that doesn't mean it's inaccessible for players new to RTS games: robust tutorials, a simulated campaign, and a free online mini strategy guide make it easy to get into the game, but hard to master it!